This past summer, we rented a house for a couple of weeks in Newport, Rhode Island. I blogged quite a bit while I was there, and spent a lot of time in the house while my son took his naps, and of course after his bedtime. We really enjoyed our time there. Staying in someone else’s home for a long period of time is a good way to figure out what you love, and what you would never do in your own home. I made some mental (and actual) notes about these things so I would remember them later. And planning this summer’s vacation has reminded me to dig those up and share them here! 1.) Avoid colored wine glasses. So much of taste is based on what we see, smell, feel, etc. The homeowners provided these lovely cobalt blue wine glasses, but sadly, all of the wine we drank from it was disappointing. I honestly think it was because we couldn’t see the contents of the glasses from which we were drinking. You couldn’t really even tell if it was red or white wine you were quaffing! Clear glass is the way to go, for sure – keep it simple. 2.) Plantation shutters are kind of a pain. 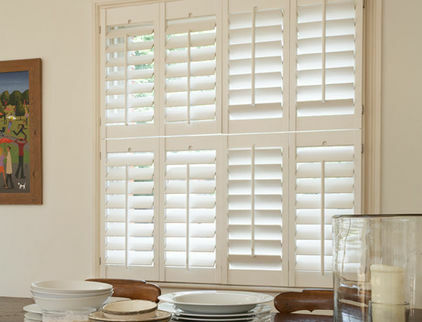 I’ve never lived with shutters before, and although I found them to be a great pairing with Roman shades and a good way to control natural light, they can be very finicky if you have to open and close them for any reason. You have to line them up just right. Maybe these are a good option for you if you never open your windows, and don’t need to regularly access them. But they’re also not cheap, so you’d want to consider if they are a good match for the way you live before taking the plunge. 3.) 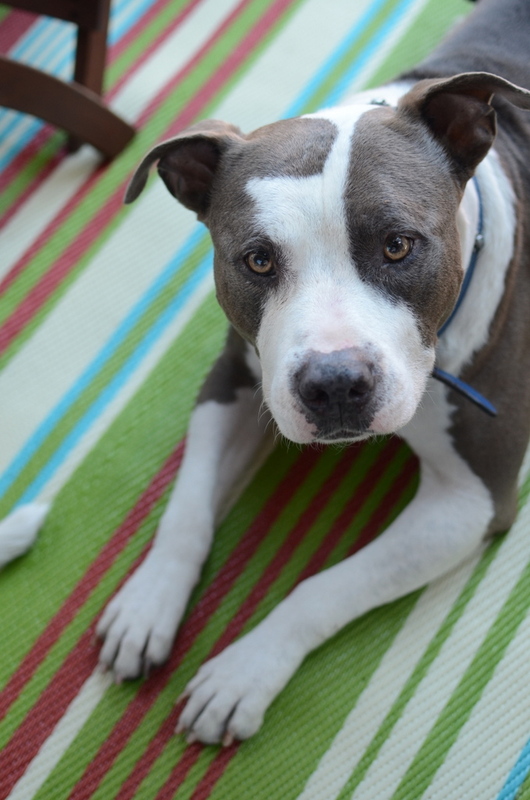 (Shedding) pet owners need to be mindful of the color of their area rugs/flooring. The rental home had a fantastic family room with tons of well laid-out seating – and a huge tufted wool rug with a mostly black background. I think we must have vacuumed that thing every other day (and we’re not neat freaks) to clean up what my lemon beagle (with tan and white hair) left behind. And in the summer, that was quite a lot. Your best bet for rugs, and flooring in general, is to find options that have coloring similar to your little four-legged friend’s. 4.) Babies love ceiling fans. OK, this is no big revelation, but having a ceiling fan in the room where my son slept in a strange house was a lifesaver. 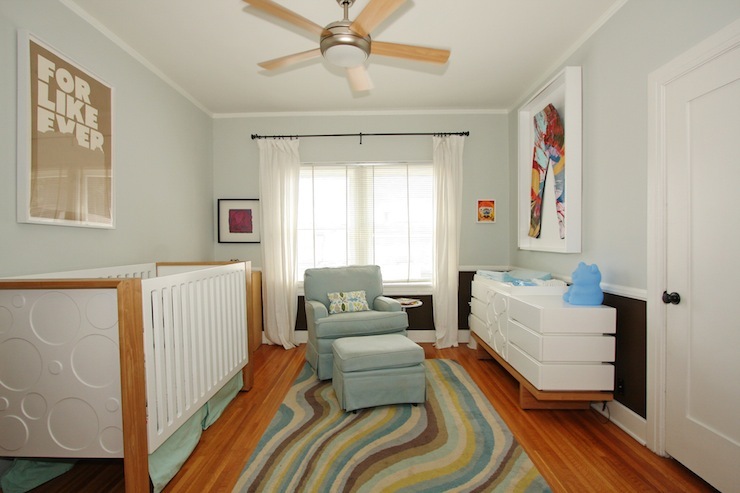 If you are an expectant parent and are designing a nursery for your little one, I’d strongly recommend considering installing a ceiling fan! There are some great designs now that don’t look like the one in Grandma’s dining room when she decorated it back in the 80s. 5.) In the kitchen, bigger is not necessarily better. The kitchen in our rental home was recently renovated and boasted new appliances, a coffee bar, and a huge triangular island in the middle (of a relatively square space). At first, it seemed great – ability to sit people on both sides, and lots more counter space. However, as we spent more time there, the island always seemed to be in the way. It blocked the part of the work triangle between the range and the refrigerator. Drawers and cabinets at the ends of the island opened to awkward places and always seemed to be in someone else’s, or some major appliance’s way. The lesson here is to not cram as much as you can into a kitchen in order to maximize counter space, storage, etc., at the expense of being able to move about freely while you are cooking, cleaning, or just hanging out. 6.) 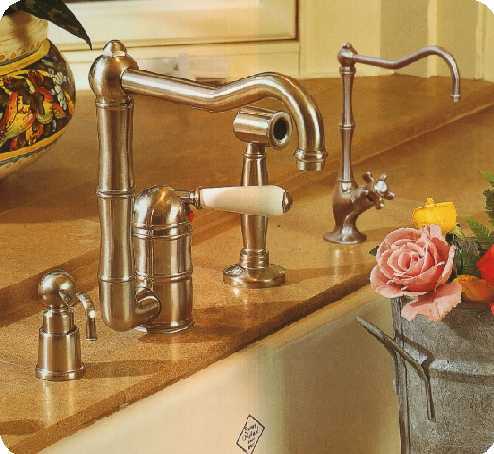 Think twice before you install that long-necked faucet for your kitchen. One of the most beautiful elements in the entire house was a long-necked, polished chrome Grohe contemporary faucet at the main sink in the kitchen. It really was stunning and initially made me think I had made a mistake selecting a faucet with a much shorter neck for my own kitchen. I quickly changed my mind after the first use. The arc of the neck was so high and the stream so long and powerful that water splashed everywhere (and I mean everywhere) the moment it hit a dirty dish. When assessing plumbing fixtures, think about how they will work in your kitchen or bath, and not just how they look. This goes not just for the spout, but also for the temperature and volume controls, as well. 7.) Paint a “suite” one color to make it appear more spacious. If you have rooms that are connected or adjacent, and want to make them feel like a “suite” (for example, guest quarters), paint the walls the same color throughout. Or, paint them in colors that are very closely related (e.g. the bedroom is the full strength color, and the bathroom is a half-tint – or, 50% strength – of that same color). The home we stayed in was done this way, and it really worked. Our master bedroom and bath were not huge, but it felt more expansive and luxurious when ‘packaged’ as a suite. Have you ever loved or hated anything about a place you stayed that helped you refine your own home? What a great post! It’s a “been there done that” post that comes from experience. Very cool. 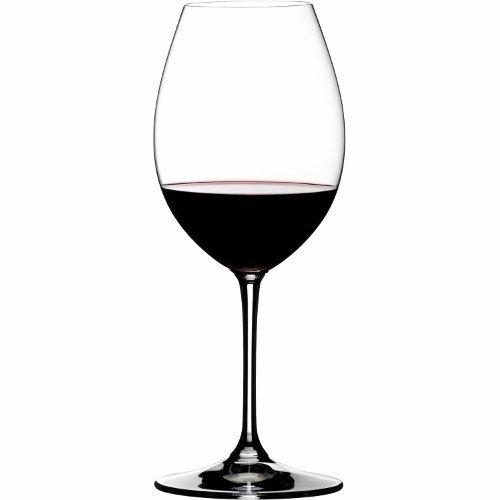 Interesting about the wine glass – plus – the fact you can’t see the dirt or dust in a colored glass. Clear is best. And yes, I happen to love ceiling fans – they are a life saver for oh so many reasons. Thanks, Donna! Yes, the wine drinking experience was bizarre. I’ve always been a clear glass/white porcelain kind of gal anyway, but it was an excellent reminder that there’s good reason for that and no need to stray :).